The Co Waterford-born playwright and novelist, Tom O’Brien has just had another successful three week run with another new play, No Blacks, No Dogs, No Poles, in London’s Pentameters Theatre. The play despite its provocative title with echoes of a time when ‘No Irish’ might have given it a London context, but this play is set in an Irish town. I was not able to attend its premiere, but Alan Cliff the (up to last year) Waterford-based playwright went along and gave me his considered opinion. Alan is studying theatre in Manchester. He described the play as complex in structure with at least four aspects overlapping; the return of a son-in-law, who has married an Aboriginal Australian and this brings out themes of racism and bigotry; a revelation of another characters bi-sexuality; the introduction of drugs into the family via a hostage situation; the revelation of an illicit family member’s affair. The London reviews suggested some confusion with themes of racism, immigration, identity and a longing for the past, spiced with sexual repression. To coincide with this production O’Brien has brought out a collection of three plays, all with Waterford connections, with the title, The Waterford Collection, and its three plays show the detail and proven ability of the author to forge a career for himself. I still find it hard to understand why no Irish or indeed no Waterford theatre group have as yet staged one of his plays. Stagemad Theatre Company were to do so, but it never came to rehearsal stage. 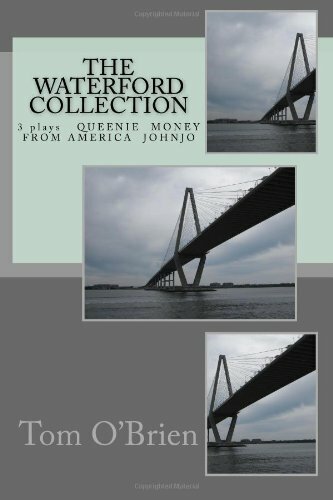 The cover is impressive with three pictures of the new bridge. The first play Queenie is a 5-hander and tells a poignant story of Victoria Dwan who has been institutionalised, and is now being ‘released’ back into the community. This features open-air stage dancing at Granagh Cross, as she wheels around an indigent accordion player in a pram. This seems so surreal and Beckettian, with a wild theatricality. Queenie is a troubled soul who has second-sight. The play is beautifully ‘threaded’ with music and songs. The second play, Money From America, is a much darker play about two brothers and a farm. Lardy has spent a lifetime toiling on the Co Waterford farm for little reward, and his older brother Jack returns from America and sees the farm as his rightful inheritance. This conflict involves two female partners, who would not be out of place in a McDonagh play, and it has a dark and dangerous resolution. The third play, Johnjo, is a one-hander, a monologue set in the late seventies, and is a study of Johnjo McGrath from cradle to grave, from the Comeragh’s to wartime England and the dark underbelly of the construction industry. This is a harsh unrelenting play, but it held my attention all the way, and it is filled with songs and music that is as nostalgic as it is ironic.